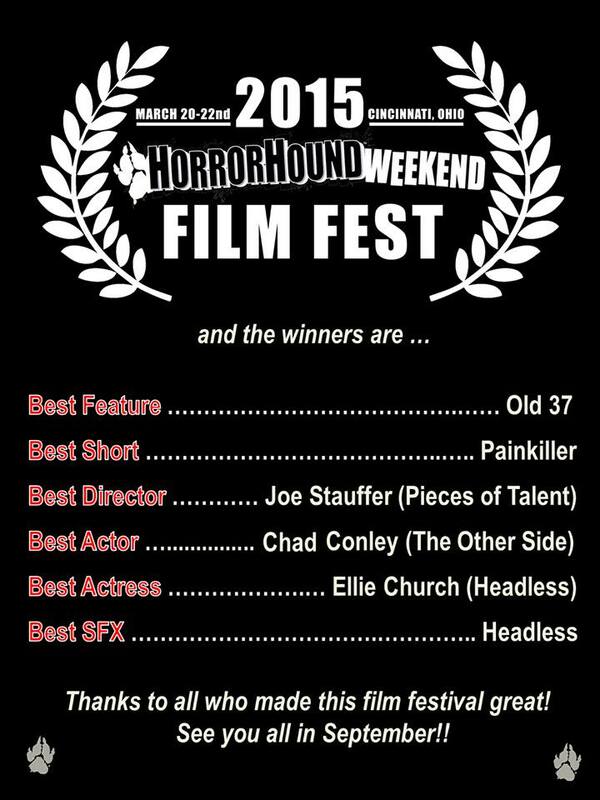 PAINKILLER received three nominations at the 2015 HorrorHound Weekend Film Festival — including best director and best actress — and won the award for best short! This award is a tremendous honor, and one that the cast and crew share with all of our supporters. We are grateful to everyone who has helped make PAINKILLER possible. And we hope that this award — one of the many that PAINKILLER continues to win — helps validate all of the contributions and efforts that our supporters made on our behalf. We could not have achieved anything without them. If you haven’t seen PAINKILLER yet, check out the trailer to get a taste of what you’re missing. PAINKILLER is available through DVD purchase, digital download, and online rental. Watch it and find out why the film is considered one of the best horror shorts!